St. David's Cathedral on the Right with the ruins of the Bishop's Palace at the foot of the hill. Although no bigger than a village in terms of both size and population St. David’s, because it has a cathedral, officially is Britain’s smallest city (2011 Census pop. 1,797). The cathedral, also called St. David’s, is the final resting place of Saint David, the patron saint of Wales, thought to have been born between 462 and 520 CE. St. David’s is in Pembrokeshire, at the Western extremity of South Wales, about 15 miles north-west of Milford Haven. The coastline around St. David’s forms part of the Pembrokeshire Coast National Park. David established a very strict monastic brotherhood which fed and clothed the poor and needy. The settlement which grew up around the monastery was called Tyddewi, meaning David’s House. A cathedral on the site often was plundered by Vikings and was destroyed by fire in 1087. The present Cathedral was built by the Normans. The great pillars inside have a pronounced lean since an earthquake in 1248, which also buckled the stonework behind the high altar and left an outside tower with a definite lean. An interesting feature of the interior, which seems to have been part of the original design, is that the floor of the cathedral slopes by a metre towards the west. St. David’s bones, for many centuries, were kept in a shrine which attracted pilgrims, including William the Conqueror in 1077, Henry II in 1171 and Edward I and Queen Eleanor in 1284. They then disappeared until the 19th Century when they were found bricked up in a recess behind the high altar and are now in a reliquary. Next to the cathedral is the ruin of the 13th Century Bishop’s Palace which is open to visitors. 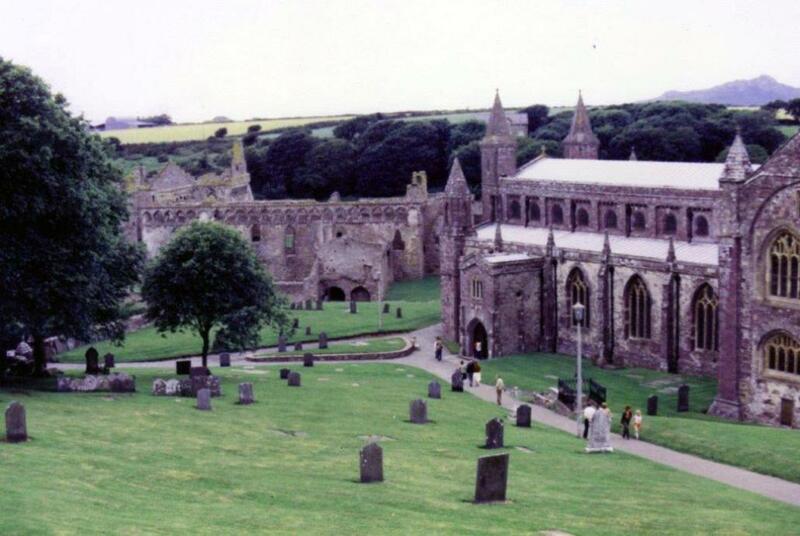 Other notable features of St. David’s include a Celtic Cross and the 14th Century Tower Gate. The front of St. David's Cathedral seen from the ruins of the Bishop's Palace. Photographs taken by George Repin in 1982. 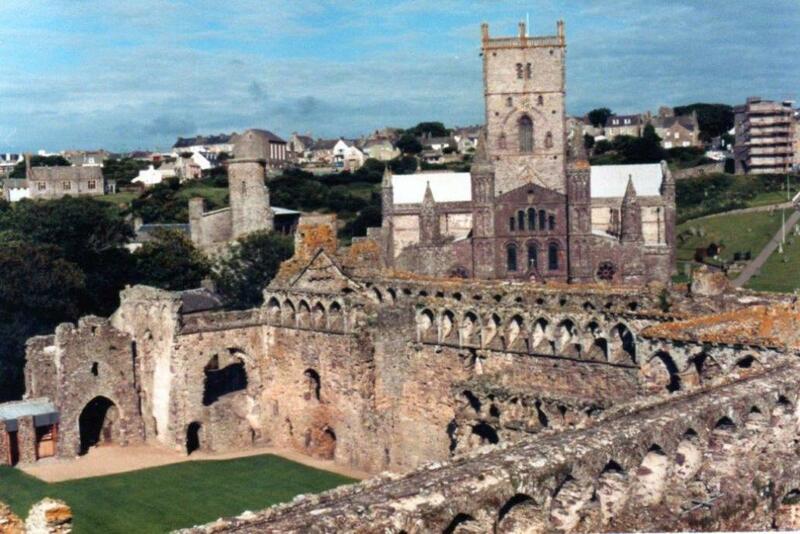 Looking over the ruins of the Bishops Palace to the front of St. David's Cathedral.